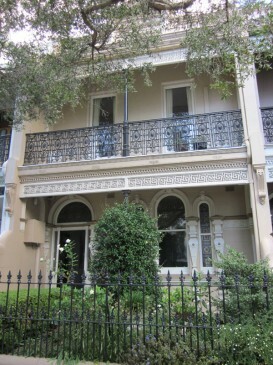 Looking back to the left across Wigram Road is Minerva Terrace (Nos 11A-17, 1895), the most elaborate Italianate terrace in Glebe, with especially rich decoration around the ground-floor windows and on the parapet, which has small triumphal arches on either side of a cartouche with the terrace name. Overtopping even these are three elaborate chimneystacks with palmettes for each flue. 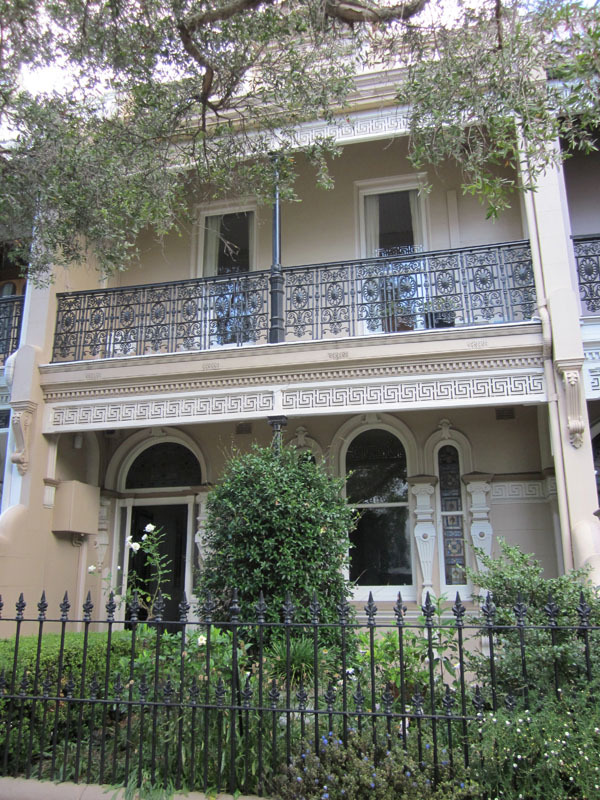 The left, or western, side of Mansfield Street has a row of large Federation terraces with tiled paths, verandahs and hallways (Nos 1-8). They have shallow, rectangular bays with gables peeping above. On the corner of Boyce Street is the Aboriginal Cooperative College,Tranby (c.1850). Tranby and another cottage, Emslee, were built on the Toxteth Estate before subdivision for friends of the Allen Family, and hence do not share the characteristics of Late Victorian dwellings. They are symmetrical and belong to the Late Colonial or Post Regency period. To see the interior of Tranby, including the modern round classrooms at the rear, please enquire at reception. Entry may not be possible if the building is being used for classes or events, as is frequently the case.